Henry V was king of England from 1413 to his death in 1422. He was famous for leading the English to victory over the French at the Battle of Agincourt in 1415. Initially, Henry V was not in line to the throne. After the exile of his father, King Richard II looked after the young Henry and later took him in his service to Ireland. In 1399, Henry V’s father (Henry Bolingbroke) returned home to claim his Lancastrian estate. However, because of the popular discord with the rule of King Richard II he was able to usurp Richard II, and reclaim the crown for the Lancastrians. This meant the future Henry V was recalled from Ireland and given the title ‘Prince of Wales’. Around this time, the Welsh rose up in rebellion led by Owain Glyn Dir, and Henry IV was forced to send troops to the Welsh borders. His difficulties were further increased when Henry Percy (Hotspur) also rebelled over a feeling of mistreatment by Henry IV. The young Henry was involved in fighting for his father, and nearly died after being hit in the face by an arrow. These records of valiant fighting, go to a large extent to disprove the more popular image of a riotous and carefree youth of the Shakespeare play. It is likely Shakespeare exaggerated these qualities for dramatic effect. Nevertheless, there were political differences between father and son. In 1413, Henry IV died and Henry V was crowned at Westminster Abbey in the month of April. Henry then turned his attention to France, where he had the dual aim of reclaiming his title King of France and also securing parts of France considered to be English. In 1415, he took his army to France and, at the Battle of Agincourt, led his army to a famous victory. Helped by his bowman, they defeated the French army, even though they were heavily outnumbered. The battle was later immortalised by William Shakespeare. In the next few years, Henry V would lead more successful campaigns taking Rouen and Paris. Disunited because of disputes between Burgundians and Armagnacs, the French, in the Treaty of Troyes, agreed that Henry V would become heir to the kingdom of France. In 1420, he married Catherine of Valois, the daughter of the French king. They had one son, who became Henry VI. 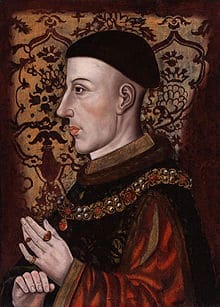 King Henry V died in 1922, from dysentery, aged only 36. He failed to be crowned King of France (he was outlived by Charles VI) and English gains in France would later be wiped out. Citation: Pettinger, Tejvan. “Biography of Henry V”, Oxford, UK. www.biographyonline.net, 27/02/2011. Last updated 1 March 2018. 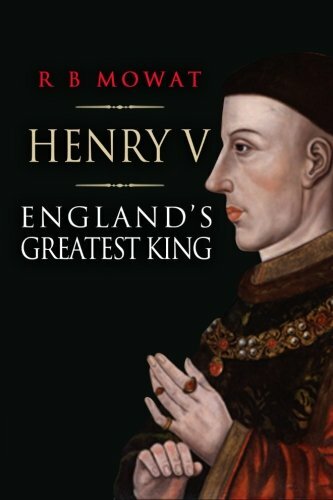 Henry V – England’s Greatest King at Amazon. Royalty – Famous Kings and Queens throughout history. Including Henry VIII, Queen Victoria and Catherine the Great.